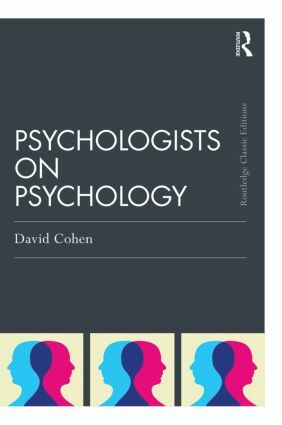 This is a Classic Edition of David Cohen’s unique collection of interviews with eminent psychologists, first published in 1977. The book presents conversations with thirteen of the world’s great psychologists, who dominated the subject from 1950 to 1980, and who shaped psychology as we know it today. Those interviewed include Burrhus Skinner, Donald Broadbent, Hans Eysenck and also R.D Laing, Noam Chomsky, and Niko Tinbergen. This classic edition contains a newly written introduction which contextualises the interviews as a critique and diagnosis of the problems of contemporary psychology in the mid 1970’s. Together, the interviews cover a broad range of approaches, and the lively debates about theory, practice and what it means to be human which were occurring at that time. The book shows the different approaches each psychologist has to the subject and why, in terms of background, education, experimental research and personal preference, they came to the positions they hold. The classic edition of Psychologists on Psychology provides an astute, critical snapshot of psychology at that time. It will be of great interest to anyone with an interest in psychology, the history of psychology, and the history of ideas.